As you know last December, ten leaders of major European economies (but unfortunately NOT Ireland) agreed on what would be included in the world’s first regional financial transactions tax (FTT). While this should have been a cause of celebration, talks have floundered – despite negotiators setting themselves a deadline of June this year. A lack of political will has held up the process. And since the announcement, the banks have gone in to overdrive: trying to kill this tiny tax that could do a lot of good for people and planet as well as shining a light on their hidden industry. That’s why we have launched our latest campaign together with all the other European campaigns for the RHT 'The Time Is Now': to remind Europe’s leaders why we need an FTT immediately. We’re asking supporters from all over the world to send messages to these politicians to let them know that billions could be used to help the world’s poorest here and abroad. Now it’s your turn. Send your message to one or all of the leaders and over the next month we’ll deliver your message offline, put it in their faces so they can’t ignore it. 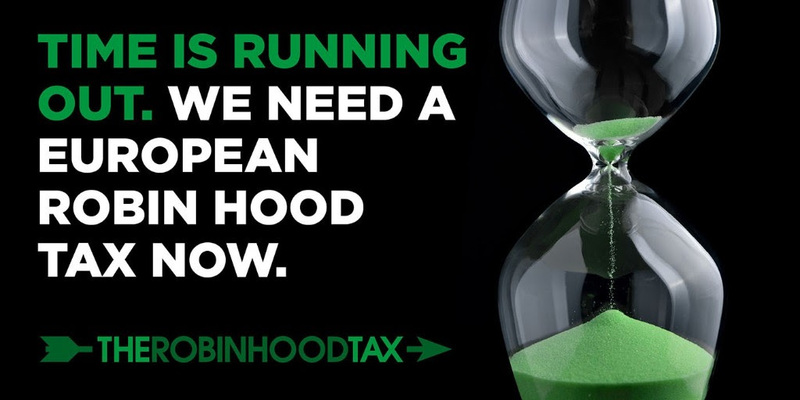 After years of negotiation, the finishing line is in sight for the European Robin Hood Tax. But will leaders fall before the last hurdle? Help us make sure they get the message.